The other day, Wai Jia asked me if I miss home. I replied and asked which home? I answered I don’t miss any of these places. When I was living in Singapore serving with OMF International, there were many moments I longed to be back in Canada. I missed the snow. I missed my friends. I missed having really good Canadian food (ok technically I miss food I enjoyed when I was in Canada such as nachos, chicken wings, and poutine etc….). Poor Wai Jia, there were many moments she had to endure of my rants during the first year of our marriage. As missionaries serving overseas, there are moments when you have that desire to be back to norm of where you are from. This time, in Uganda, it is different. One of the latest revelations I had is that even if tomorrow Wai Jia and I are back in Canada (or in Singapore), I realized we won’t be content staying there. Sure, there are conveniences we will appreciate like consistent running water and electricity, fast internet or fine dining. But we realized we won’t be following the Lord’s Will. In Singapore, I missed my family a lot, especially my aging parents. Within the short span of three months of being in Uganda, I had the privilege of receiving news of two nieces being born in Canada. I would love to be there in person. But I cannot. We are called to follow Jesus. Holy Spirit has opened doors and brought us to Uganda. Today’s the Utmost devotion was very timely. It was talking whenever there are conflicting loyalties between Jesus and others, even family matters, always pick Jesus no matter what the cost. Earlier in this month we went to Burundi to teach for two weeks. Wai Jia noticed I was on fire during one of the classes. I was teaching about the suffering we endure when following Jesus. The students were seasoned pastors and evangelists and many of them had suffer personally from following Jesus. One female student was Muslim and was rejected by her family when she accepted Jesus. As I was sharing, I kept back my tears as I was recounting my own costs and realizing that many of them suffered much more than me. I realized I need to deliver this message from the Lord to encourage them to persevere and not give up or give in. I use Hebrews 12:2 to encourage them and myself that even Jesus had joy when he was going up the cross. There’s joy in suffering. There is fellowship in suffering. Now we are in Uganda, I don’t desire to go back to Canada as much as I was in Singapore. Perhaps I’ve grown spiritually. Perhaps I finally accept the fact that I have no home (even Jesus said the Son of Man has nowhere to lay His head [Luke 9:58]). Perhaps my mind is being renewed with the mind of Christ and it changed all the priorities and desires of my heart. Right now, I just want to do what the Lord wanted me to do. Life is too short. There ain’t a lot of time left. I just want to be obedient to His Calling. Wai Jai and I are in Uganda to equip and build the body of Christ so that they are mature, pure and blameless before the Lord. And there’s much work to be done. Here in Uganda, I am slowly understand what it means to labor for His Kingdom. The desire to follow Him is stronger than the earthly home. I desire a better home! A heavenly country! This is a great passage to encourage yourself to follow God, especially during hard times. Pressing toward reminded me of the races I used to compete. It is painful and it hurts. At the moment it is hurting is the moment I need to press it and not give up. The same principle applies in our walk with the Lord. I am thankful for passage like this. Paul knew what suffering is. He had been persecuted, stoned, beaten, jailed, and shipwrecked. I am 34 this year. I hope that when I am 54 or 74 I still have this desire as Paul has, to reach the goal for the prize of the upward call of God in Christ Jesus. 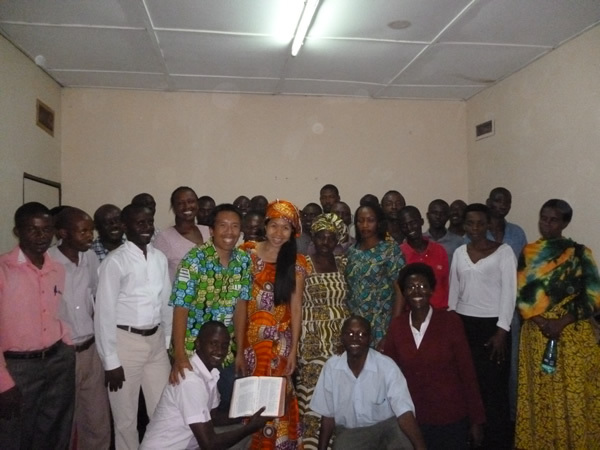 We took a picture with the students on the last day of us teaching at Bujumbura, Burundi. We are wearing traditional Burundian wear which the students generously gave us. How can we have free will if God is Soverign? When we are born from above we understand what is incomprehensible to human reason – that the predestination of God and our infinitesimal lives are made one and the same by Him. From the standpoint of rationalism that is nonsense; but it is revelation fact. The connection between the election of God and human free will is confusing to our Gentile type of mind, but the connection was an essential element underlying all Hebrew thought. The predestination of God cannot be experienced by individuals of their own free choice; but when we are born again the fact that we do choose what has been predestined of God comes to us as a revelation. This is taken from Oswald Chambers’ So I send You & Workmen of God. There is always the danger of starting up false enthusiasm in missionary work. “Oh yes, I will go; where shall I go?” That is like making a false start in a race and having to go back to the starting point. Our Lord’s word go simply means live, and Acts 1:8 describes the going. Jesus did not say to the disciples, go to Jerusalem, go to Judea, go to Samaria, go to the end of the earth, but “You shall be witnesses to Me” in all these places. He undertakes to establish the goings. So many people are obesessed with this idea, “What are you going to do?” I hope none of us are going to do anything; I hope we are going to be what He wants us to be. what does it mean to be His Witness? What does He wants me to be? Do you agree with Oswald Chambers’ writing? Disagree? As Wai Jia and I read this this morning, she mentioned many asked us why Uganda and what are we going to be doing there. Perhaps, the better question is what does Jesus wants us to be. This is a wonderful section we read this morning for our devotion. The quote, therefore pray, is from Matthew 9:38. It says: Therefore pray the Lord of the harvest to send out laborers into His harvest. We pray to the Lord of the harvest. There can be many things we pray for. But the emphasis is to the Lord of the harvest. Noticed that it is the Lord of the harvest that sends out the workers. The workers didn’t decide themselves where to go and what to do. The Lord of the harvest have the plans. The workers are to follow from the Lord. This the nature of relationship between the master and his labourers. Or between us, follower of Christ, and the Lord of Lords! There are many times we want to pray but get distracted. I have many things on the to do list (I have one right now). If I don’t do the work, no one else will. The whole mission project depends on me to get my work done. But this shouldn’t be the case. Oswald Chambers says that prayer is the work. Prayer is not to prepare us for the work. I remember a long time ago, some of us joked whether Jesus said in John 14 is ever going to happen. Really? I pray anything I want in Jesus name and He will do it for me? This is actually immature thinking. What Jesus implies is that when we are so connected with Jesus, He will do the things we ask because it is the thing He wants to do. The prayer is not what I want but rather what He wants. Personally, I believe that I need to be as Oswald Chamber says, more stupid. It is not about great ideas I have in my head for His Kingdom. But rather the works He wants me to do for His purpose. And the work is done through prayer. I packed Oswald Chambers’ two books in one, So Send I You and Workmen of God, with us to Uganda. One of the joyful moments we have every morning is reading one chapter for devotion. Since following his devotion’s My Utmost for His Highest, I enjoyed reading Oswald Chambers’ writings. His words bring clarity to Spiritual truths in such a profound way I don’t get from reading other authors. I am not implying the other authors are not good. But for me, Oswald Chamber’s materials are true gold. He never softens the truth when it needs to be hard. He always brings the truth to its edge where it shows where my life still needs maturity. His materials are meant for those who take following Jesus seriously or else the reader will not have the desire to follow. Interesting, at times Jesus’ words can be sharp and feels ‘discouraging’ (see Mark 10:17-22 or John 6:60-66). Of all the missionary-preparation books I read, by far, this book is my highest recommendation for anyone who desires or contemplate to be a missionary or missionary service. Many books talk about dealing with cultural, transition, language, and worldview issues etc., and these topics are important. Sometimes in desire to do mission, we can easily left out a missionary’s main focus, God. Oswald Chambers reinforce this over and over again. Wai Jia and I had the opportunity to speak to many youths in various churches regarding missions. One of the frequently asked questions is how do I know God is calling me to such a place? These calls are heard by a few only because the call is the expression of the nature from which the call comes, and can only be heard by those who are attuned to that nature. Am I attuning to the one who calls? Which is God, Himself. It is so important to be able to attune or to discern His voice. Oswald used Isiah as an example. In Isaiah chapter 6, Isaiah was in such a crisis which he was able to attune God. I am going to side track a bit. Notice that the immediate response Isaiah gave when he saw God was the realization of his own sin. Not just confessing sin in a general statement. But a very specific sin which he personally know he is in condemn for, a man of unclean lips. This is the response when we are in the presence of a Holy God. We instantly see our personal individual sins lit up like blood stains on our hands. This is taken from Oswald’s devotion on Utmost. This birthed a ministry for Isaiah cost him his life. God used him mightily as the last warning before Judah is to receive judgement through being conquered by the Babylonians. Back to the question that the youth asked, how do we know where God is calling us? My standard answer would be ‘well pray about it, read the Bible, talk to your pastor, research on different missionary organizations.’ It seems so random and without an element of God in it. The better answer is to have the right relationship with God. God’s call is not random or required some advance deciphering device. We just need to attune ourselves to be in the right relationship with God. To be brought within the zone of God’s voice is to be profoundly altered. The call of God is not a call to any particular service, although my interpretation of the call maybe; the call to service is the echo of my identification with God. My contact with the nature of God has made me realize what I can do for God. Service is the outcome of what is fitted to my nature. God’s call is fitted to His nature. When I have received His nature, then His nature and mine work together; the Son of God reveals Himself in me, and I, in my natural life, serve the Son of God in ordinary ways, out of sheer downright devotion to Him. If our youths are interested on missions and are not sure what to do, the first and foremost we should help them attune their lives to God. Just like in Isaiah’s case, God didn’t ask or command him. The instant Isaiah is attuned with God, he instantly recognize the opportunity to serve. ..there is no call to service for God; it is my own actual “bit,” the overflow of super abounding devotion to God. God does not have to come and tell me what I must do for Him; He brings me into a relationship with Himself where in I hear His call and understand what He wants me to do, and I do it out of sheer love of Him. In short, don’t focus on do, focus on having a right relationship with God. When our heart and ear is attuned to Him, our eyes will see how we can serve Him! Serving is the by-product of being in the presence of the Lord.